Office Procedures | George R. Gottlieb M.D., P.C. We are looking forward to meeting you! 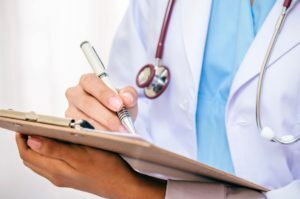 Once your appointment has been made, we will send you some forms (or you may get them from this site on our New Patient Forms page) asking about some of your symptoms. Please complete these forms and bring them with you at your first visit. We are contracted with most insurance plans. We are happy to answer any questions you may have. Some medical plans require a referral to see a specialist. If your insurance has this requirement, please be sure to obtain the referral from your primary care physician prior to the appointment. If your plan requires a referral, we must receive this referral before you can be seen. Please bring your insurance card and a list of your medications that you are currently taking (prescription and over the counter). A short sleeved shirt should be worn so that the testing can be easily performed. Because the first visit is rather lengthy and we have a waiting list of patients to be seen, we request that any cancellations be made 48 hours in advance; otherwise, there is a cancellation fee of $100. Because strong fragrances cause problems for our asthma patients, we ask that you not wear any fragrances to your appointments. Thank you for choosing our office for your asthma and allergy needs !